Peak Health News, Issue #005 -- <> Subtle Body Messages: How to Tune In! Peak Health News #005 kind of wrote itself. 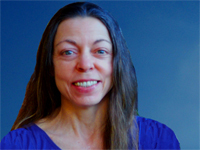 The inspiration here is to share with you a true story that can help you tune in to some of the subtle ways your innate body wisdom may try to communicate with you. * How Listening to Subtle Messages of the Body May Have Saved a Life! * Why Supplement With Magnesium? I'd just finished making a generous glass of fresh carrot/beet/apple drink, and decided to take with it a wonderful amino acid supplement that balances blood sugar. I wanted to see if I noticed better energy, alertness and mental clarity by balancing the carbs of the juice with the aminos, which are protein building blocks. (I did). As I tipped the bottle, 3 capsules fell into the palm of my hand. 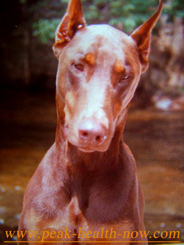 Over twenty-five years ago, I adopted a six year old, intact male red Doberman from an animal shelter where I did volunteer work. He was beautiful, obviously well-bred, but had been on a junky commercial dog food his whole life, abused and neglected, and was (understandably!) rather depressed. Not long after I adopted 'Erik the Red,' he came down with prostatitis - inflammation of the prostate. He was losing control of his bladder and urinating blood. Though I had begun switching Erik to a raw, homemade diet, obviously his stressful junk food past was catching up with him faster than I could redeem his health. I brought Erik to a well-respected holistic vet near Boston. The vet outlined a rigorous therapeutic regimen for Erik. This included a very restricted detox diet and an aggressive homeopathic cleansing protocol. Three times a day, I funneled 12 homeopathic remedy tablets into the side of Erik's mouth using a folded piece of paper. No problem; he loved the taste! However, skinny as he was, Erik's coat had taken on a sheen like polished lacquer. His body looked very clear and clean and he had more energy than before. The blood coming out in his urine diminished significantly. So I continued with his protocol. About 2 months into the regimen, I had Erik out on the lawn one day. When he urinated, I was startled to see big clots of blood being expelled. After that, the blood in his urine dwindled and disappeared. Shortly thereafter, I found myself occasionally forgetting to give Erik his homeopathic pills. The forgetting got worse until a few weeks later, I was not giving him any at all! I struggled mightily to remember, but somehow a thick fog settled on my brain and I forgot. There were many more doses in the bottles, but the bottles ended up getting tossed aside. My forgetfulness became so bad, I finally gave up. Erik started gaining muscle, had more energy and was happier than before, so I let go of the protocol. I put him back on the balanced, raw homemade diet he'd been on before. Now Erik could enjoy his favorite foods; beef liver and hamburger. Erik returned to normal weight, looking better than ever. His coat still had that fabulous sheen, highlighting a stunningly beautiful, muscular, athletic Doberman physique. The prostatitis was gone, never to return! Why had I stopped Erik's protocol before completing all the doses of (very powerful!) homeopathic medicine? Fast forward to a conversation with a German Shepherd breeder friend of mine who had taken her own dogs to the same vet. In addition, she'd recommended other friends of hers take their dogs to him. When I told her the story of Erik's protocol, I was amazed to learn 'why' I kept 'forgetting' to give Erik his pills. The breeder told me that more than a few dogs who were kept on the homeopathic pills and severely restricted diet for too long - had suddenly died! In subtle ways, the messages of your body's innate wisdom try to break through the 'shoulds' and 'shouldn'ts' that our mind dictates. Feeling and sensing is not commonly included in our life's education. I encourage you to tune in! As you honor them, the messages will gradually become easier to hear and you will chart your course to Peak Health with greater clarity and confidence! I want to talk today about one of the most if not THE most common mineral deficiency: magnesium. It is rare for me to advocate an emphasis on a single nutrient, as many sources of information do (very often depending on what they are selling). Commonly, I suggest to my clients to maintain balance in their supplementation program. However, achieving balance can also mean taking more of a specific nutrient to make up for a dire lack. Magnesium is very depleted in our soils because fertilizers typically don't contain it. On top of that, it is the most difficult mineral to absorb because it has the largest molecular structure. It is easy to lose HUGE amounts of magnesium through stress, sugar, coffee and alcohol consumption, drugs (prescription and illegal), excess salt intake, and sweating (exercise, saunas, etc). Magnesium is one of those cases where deficiency is SO widespread, it doesn't hurt to add a magnesium supplement to most peoples' self-care program. NOTE: Those with compromised kidneys are at risk and should consult their doctor before taking any magnesium. This is because people with kidney problems can't eliminate any magnesium and run the risk of an overdose. However, the vast majority of people with normal kidney function stand to benefit greatly from increased magnesium intake. Did you know that more than 80% of people in the US are magnesium deficient? (That's a very modest figure - most likely it is higher). Over the last number of years, every person I know who has added an easily-absorbed form of magnesium has benefitted. A client of mine with severe Fibromyalgia, who at first did not feel much from the Medicardium, recently confessed that she so loves how she feels from using the suppositories. She looks forward to going to sleep just so she can experience the lovely tingling of increased circulation and deeply relaxing effects of the Medicardium! Did you know that magnesium is ESSENTIAL in over 300 biochemical processes in the body? I was fascinated to find out that magnesium plays a key role in hormone transmission and how the cell membrane potential adjusts to take in hormones such as estrogen, testosterone, thyroid, etc. In addition, magnesium helps in the regulation of neurotransmitters like dopamine, GABA, serotonin and so on. A long list of conditions A - Z has been clinically found to be associated with magnesium deficiency. Just a few to incite your curiosity; Alzheimer's, tooth decay, Fibromyalgia, cardiovascular disease, Multiple Sclerosis, stroke, hypo and hyper thyroid, blood sugar imbalances. Here are a few hints: Cut down or eliminate sugar, alcohol, coffee (NOTE: coffee enemas do not have same effect as drinking), smoking anything, carbonated soda and drinks. If you are involved in an intense physical conditioning program, magnesium and other supplements are a must. NOTE: When taking more than 250 mg magnesium per day, it is a good idea to also include a full-spectrum vitamin/mineral and also a high-quality, easy-to-absorb zinc supplement as magnesium and zinc need to be kept in balance. Just as taking a single B-vitamin for more than a short time (1 - 2 weeks) would call for a B-complex supplement to go along with it, the same holds true with therapeutic amounts of any element. A professional grade, multi vitamin/mineral product and a full-spectrum amino acid (protein building block) supplement are a good foundation. Other nutrients can be added depending on your individual needs. As I research magnesium, I am finding its effects and importance immensely far-reaching. If I were to devote the rest of my life to writing about this one subject, I could never know or write about all there is to know. I intend to put up some website pages about magnesium; it is that important. I take supplemental magnesium myself and also use Medicardium regularly to great benefit. I hope you enjoyed this issue of Peak Health News! I wish you the very Best of Health! for the most in-depth information on proven, effective ways to achieve and maintain Peak Health. © 2008 - 2011 ™Peak Health Now.com. All rights reserved. Disclaimer: Any and all articles, answers and comments on this site are for general information, and are not intended to be a substitute for your informed professional medical or other professional advice. You are responsible for the results or consequences of your choices based on general information presented here. Information is used at your own risk. The owner expressly disclaims liability for any product, manufacturer, distributor, service, or service provider or any opinion expressed in answers or comments. For all health and medical questions, please consult with your doctor. By viewing this site, you are stating that you agree with this disclaimer.